As the human population increases, the strain on all resources increases. Natural areas are no exception, and the fascinating tide pools of the ocean shores are especially threatened by over use and inappropriate use. Many popular areas for "tide pooling" are in danger of being loved to death. One purpose for this Guide is to help teachers and other group leaders learn to protect this unique habitat when they bring students to visit, enjoy, and learn about the intertidal areas of the coast. 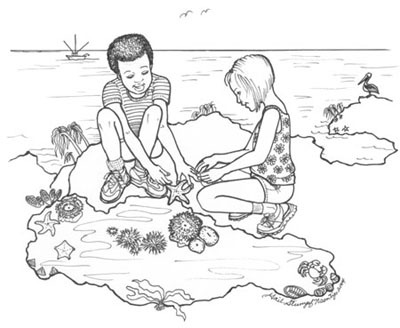 Not only does the environment need protection, but students must be taught how to explore the tide pools safely. This Guide provides information about how to be safe while visiting the rocky coast. While a teacher does not have to be an expert on coastal organisms or ecology, a basic understanding of ecological principles will enable the teacher to help students to maximize their learning during the precious time spent visiting intertidal areas. This Guide provides that basic knowledge, and teachers and other users of this Guide should use it to review the basic science content before taking students on a field trip to the coast. A trip to the intertidal area should not be an isolated activity. Rather, it should be part of a larger unit of study. It is important that students view their visit to the intertidal zone not as just a day out of the classroom or as just a day at the coast. A field trip to the coast should, of course, be enjoyable, but it should also provide the student with opportunities to learn about and to increase their appreciation for the plants and animals inhabiting the intertidal zone. The dozens of lesson plans (for both before, during, and after the trip) and teaching ideas included in this guide will help ensure students get the most from their tide pool visit. Although A Guide to the Side of the Sea is specifically designed for use with tide pool visits to the northern California coast, the following parks also offer the chance to visit tide pools, and much of this guide is still applicable to the plants and animals you will find there. Although there are no tide pools at this park, a low tide provides wonderful opportunities for students to study the creatures that live in the San Francisco Bay’s mudflats. This beach has a small section of rocky reef with intertidal creatures, but due to its small size it can’t accommodate large groups. School groups MUST have a reservation and be accompanied by Park staff to visit the area.A School Groups Reservation Request (DPR 124) must be submitted to the Park for approval.Groups are limited to 30 students and must be 3rd grade or older. Groups are divided in half and 15 students at a time are allowed to walk around the reef for 30 minutes and then the groups switch. Walks are free of charge and day use fees may be waived if a DPR 124 is received and approved. Please call the park at 805 684-7487 for more information. Did you know you can take the train to this park (the stop is just a block away)? Costs are extremely low for school groups who take advantage of Amtrak’s Kids 'n Trains program. School groups can arrange for a guided tide pool program by contacting the park for a reservation. There is also a distance learning program at the park for 4th and 5th grade programs through the Parks On-line Resources for Teachers and Schools (PORTS) program. Several guided tide pool programs for school groups are offered at this park, mainly in the spring, as well as beach ecology programs throughout the year. They are in very high demand, and we recommend that schools wishing to visit call well in advance. Reservations must be confirmed at least two weeks prior to the visit. School groups may call as early as September to be put onto a waiting list for guided tide pool programs in March, April, May and June. The tide pool programs are recommended for grades 2-12. We also offer nature hikes, aligned with the California Educational Content Standards, at Leo Carrillo and Pt. Mugu State Parks. For reservations for guided and self-guided programs interested school and community groups may call 805 488-1827 and speak with the park interpreter at extension 106. Fees for the guided program are $40, and for the self-guided program are $10. Without a reservation, the parking fee of $100 per bus will apply. This park is difficult for groups to reach because of limited parking and no restrooms, but it is a beautiful location and should be considered for a family excursion or small group trip. The park hasn’t begun doing programs there but may in the future. Parking is available on Cliffside Drive and at the bottom of Birdview Avenue on Westward Beach. Free shuttles operate on the weekends in the summer to transport visitors to and from Westward Beach.